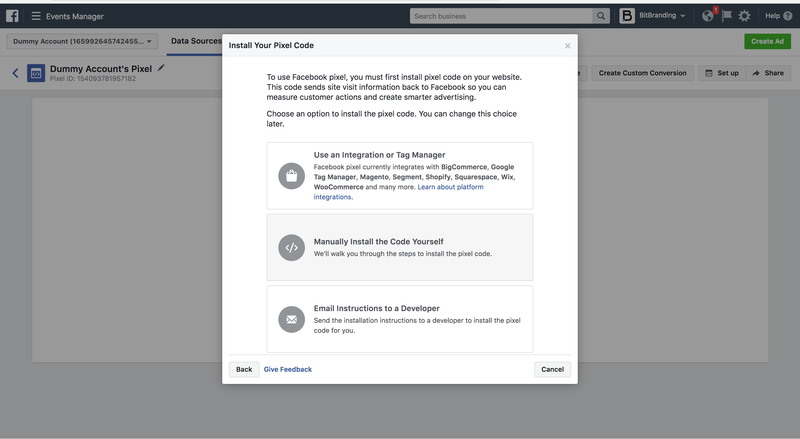 In this post we are going to teach you how to properly install a Facebook pixel on your website so that it can talk directly to your business page online. If you’re reading this there are probably one of two things happening. One, you know what the Facebook pixel is and you want to make sure you get it installed because you know how important it is. Or, the second option is that you clicked on the headline because your business is on Facebook and you were curious what you could be missing out on. Both are great places to be. Real quickly, what is the Facebook pixel? The Facebook pixel is a piece of code that you put on your website to track visitors and ultimately conversions. Adding the pixel will help you find out what your customers are doing on your website and then allow you to remarket back to them based on pages that they visited. Putting the pixel on your website also allows you to track those conversions ( maybe a purchase or download) that you have on the site and you wanted to know if your ads were actually working well. Ultimately we lose a LOT of business when we don’t remarket to our warm audiences, the Facebook tracking pixel allows us to do that. For the rest of this post, we are going to focus more on screenshots so you can visually see how to install the pixel and this should help you easily install it yourself, or, if you have any questions, just shoot us a message. Click the green “ Set up pixel” button. If you had previously created a pixel but you need to find it to install it again, click the gray “Set Up Pixel” button at the top. Change the name of the pixel to your business or something you will remember for what you are advertising. There are multiple options to choose from when setting up your account, we typically upload the code manually unless you have a web developer, then choose the email option. When you click the manual route, you will be given a step by step instruction on how to bring the code into your website and where to place it. Scroll to section 2 and then hover over it and you should be able to click and then copy and paste the Facebook pixel code. Once you have selected the code you will need to go over to your website, login, and then find the head of your website. If you have a Wordpress site, it is very easy and there is a plugin called Pixel your site if you go this route, all you will really need is your ID number, which is typically the longer string of numbers about 9 rows down. If you have any questions about this, shoot us a message. Once the code is pasted and you have saved the changes, make sure you get a tool like pixel helper to make sure you have the Facebook tracking pixel installed correctly. If the chrome extension lights up blue, you have done it correctly! If you didn’t get a blue signal, again, just shoot us a message, we’re happy to help. You can now start tracking your visitors, sending them offers, and more importantly advertising to a very warm audience. If you are more of a video person, we created this video walkthrough to teach you the exact same thing, just a different way. We hope this was helpful for you, and if it was, please leave us a comment below so we can thank you personally.